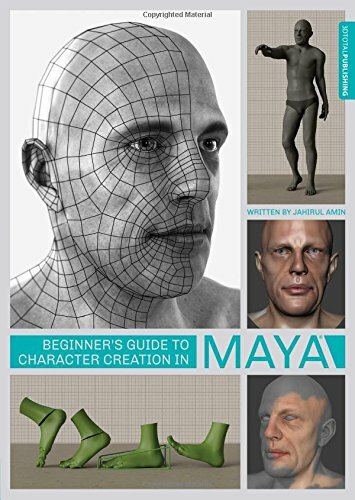 Beginner's Guide to Character Creation in Maya is one of the more detailed and in depth book that covers 3D character modelling with Maya. The first thing you need to know is the book not only covers Maya, but also uses Mudbox for some of the modelling. The software used are Maya 2015 (Service Pack 2), Mudbox 2015, Photoshop CS6 and Nuke. You can probably still use software that are one or two versions older but the book does mention new features that are only available in the new software. Second thing to note is there are more than 30 hours of video files that accompany the lessons. The video files are huge, like 59GB. Unlike other books, 3Dtotal has opted to use Bittorrent for distributing the files this time and the download speed is rather slow. If there are no seeders, then technically speaking you can't even download the file. I would have imagined that there would be at least one seeder, like you know, from 3Dtotal themselves. They should have just split up the files to go with the chapters or even page numbers. Then readers would not have to download such big files at one go, or go through the wait for seeders to appear. The book covers not only modelling but also helps you to understand the pipeline workflow. That's so that you can share your assets for others to work on while you continue to touch up your model. The book is written for beginners and covers only the tools you'll use for modelling. The tools would be those commonly used for polygon modelling. You can come in with absolutely no knowledge on Maya although it would definitely be less intimidating if you have already worked on Maya before. The Maya interface is covered in the first chapter. This book really goes into the details. There's a rather lengthy coverage on the muscles and bones in the anatomy chapter. Generally speaking, the book not only covers the technical aspects, but also wants you to understand the rationale behind. Like why do you model something this way? How do you mimic the way the human body moves in a believable manner. And before you can start to animate your walk cycle, animation concepts are presented. For texturing, there's a section that talks about the skin and how you can prepare reference images for use as texture files, e.g. how you should set up your photoshoot to capture accurately coloured photo reference. The last chapter talks about lighting and rendering. The author and instructor is Jahirul Amin is a 3D trainer at Double Negative, a visual effects/CGI company in London. That guy is a pro and you can tell by the content written and this thick 296-page book. The instructions are clear and easy to follow. There are numerous screenshots provided to show you what they are talking about. Overall, this is a rather comprehensive course, and a great book for beginners to 3D character modelling in Maya. There's so much content you'll probably have to spend a week or two to really complete all the lessons. And then there are those 30 hours of video files to sweeten the deal (provided you have no problems downloading them).